Young Queen on the Horizon!! There are often questions about female chess competitors. Who can forget the famous "Fischer Challenge" that he would give any woman knight odds. With GM Judit Polgar walking around these days, even the old Bobby Fischer would have his work cut in an even match. There is hope for women in chess and it's not coming from the former Soviet Republics. While this region still produces a formidable amount of talent, China and India are churning out strong women players at an incredible rate. Ironically in the western nations, women's chess has not caught on except at the scholastic level. Thereafter, girls take other interests and leave the game. Perhaps a change is coming. A bright star has emerged in women's chess. Sabrina Chevannes, 13, of Birmingham, England was the 2000 under-13 English champion and is currently holding the U15 & U16 Girls' titles. 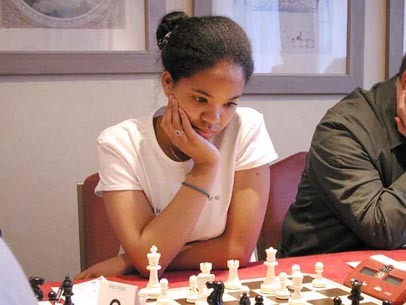 She has scored well in many tournaments including the Mind Sports Olympiad and the British Chess Challenge and is considered a chess sensation. She carries a British rating is around 153 (1824 ELO) and received some help from the late GM Anthony Miles. The above picture was taken at 2001 Birmingham Winter Open. Copyright © 2001, Spectrum Chess. Stay tuned for news on this rising star!